Sometimes employers go all in on their investment in a corporate fitness center. Thousands of square feet are dedicated to treadmill upon treadmill, thoughtful changing facilities, ample group exercise space, creative equipment solutions, and around-the-clock dedicated fitness staff. But that’s not the reality for most employers. It’s important to remember that corporate fitness doesn’t have to be an all-or-nothing proposition. You can provide programs, services, and (probably most importantly) an environment that’s conducive to movement. So if you’re trying to improve the exercise options you provide onsite for your employees, but you’re on a tight budget, consider these ideas. 1. If you have dedicated staff for an exercise program, invite them to be a Jack (or Jill) of all trades. Most exercise professionals with a college degree have a background in more than just exercise. It’s common for an exercise science curriculum to fold in public health, nutrition basics, stress resilience, and other health-related disciplines. We work with one client who has a small fitness center and no additional budget for fitness programming, and rather than lock our staff down to the four walls of the fitness center, they are out and about providing healthy lectures, offering stretch breaks at key shift-change intervals, and coordinating extra workplace wellness services like onsite chair massage. 2. Consider group fitness classes. Sure, dancing to music isn’t for everyone, but group fitness has come a long way. You don’t have to be coordinated or be able to keep the beat to enjoy a great class. And if your office includes meeting space with tables and chairs that can be pushed to the walls, you probably have everything you need to run a class. Instructor costs can be paid for by employees, subsidized by the employer, or paid in full by the employer. Check out our quick read: Three Keys to Adding Group Exercise at Work. 3. Think long and hard about your environment. How are your employees encouraged to work, and how are your leaders and managers incentivized to run their teams? Are employees expected to sit glued to their screens all day to make a quota? Do your managers have substantial pressure to meet the same quota? These kinds of unwritten cultural norms make it almost impossible for an employee to take a 10-minute walking break. Can that mindset be shifted over time? This article suggests that employers have to start taking a look at creative ways to address employee stress. What about your physical space? Maybe you can’t have a dedicated space for employee exercise, and even group exercise classes in an unused meeting room seems out of bounds. Perhaps simple signage encouraging the use of stairs instead of elevators would be a starting point to encouraging employees to move more. Think about incentives for exercise differently. Good, old-fashioned behavioral economics around loss aversion could help you build an inexpensive incentive model for encouraging more frequent exercise in a sedentary workforce. Don’t let a lack of physical space or dedicated staff derail your brainstorming about ways to inject more opportunities for activity at the office. The options are only limited by your creativity (not your budget). When our members talk, we listen. Sometimes we get good old fashioned direct, face-to-face feedback about what’s working and what isn’t, and sometimes they tell us what’s working by their participation. Such was the case with a recent squat challenge we ran at one of our corporate sites. In fact, the simple challenge was so effective, we’ve proceeded to design more programming around the same concept. 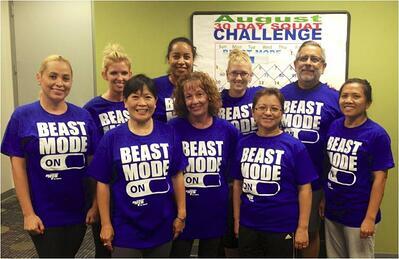 The 30 Day Squat Challenge was designed to help our members get up from their desks and choose to be active during the long and busy work days in August. The challenge ran the duration of August and we established a set number of daily squats the participants needed to complete, with every third day being a rest day. The participants could do the squats where ever they wanted (though we love when they come to the fitness center to do them) and they had all day to complete them, but they had to log their efforts at the Wellness Center. On the first day of the challenge, the expectation was for participants to complete 50 squats, and by the end of the challenge, successful participants completed 250 squats! We would never advocate performing 250 squats in a row (or even 50 in a row, for that matter), so allowing participants all day to complete the squats was a must. I loved hearing the stories about when and where participants were squatting and who they were convincing to participate with them. A lot of members got their kids and spouses involved, making it a family affair. We had a bulletin board in the fitness center with squat variations and modifications for members to follow and we integrated the squats into our group fitness classes to keep the participants motivated. It was really fun seeing everyone squatting in the fitness center; it really turned out to be a group effort. We wanted to increase visits to the fitness center by three percent compared to August 2013. This is a tough month for us to draw our members in because many of the employees are sneaking in final summer vacation time before their kids head off to school. For those members who participated in the challenge, we wanted them to increase their total time spent being active through the day by 10 minutes each day. We know how important even short, 10 minute bouts of physical activity can be for an individual’s health and we wanted to see if this program provided a means of stimulating more movement in our employee population. Finally, we set a goal to achieve a 50% completion rate. We’re constantly trying to determine what’s most effective at helping our members stick with a program, and we hoped to learn a little more about how small exercise goals might influence success rates. Up next is an Ab Challenge. We can’t wait to see how the members do and what we can achieve for participation and completion goals. If you’d like to learn more about NIFS best in class programming for corporate fitness centers, sign up for our best practice series. Many communities have regularly scheduled recreational activities on the monthly calendar such as croquet, bocce ball, or Wii that seem like fairly logical programs to spin into Olympics-themed events in senior living communities. Still, it’s not enough to simply group these regularly occurring events together and call them your Community Olympics. How do you set up the initiative so that it has broad appeal and allows those residents who participate in the events regularly to feel inspired and challenged alongside their novice neighbors? This two-part blog will provide creative tips to kick your Olympics up a notch with your resident favorites as well as provide fresh new ideas for events. Many active aging residents, who participate in weekly recreational offerings such as shuffleboard, putting contests, are quite good. Wait, I take that back –they are really excellent! After all they are playing on a regular basis (perhaps their entire lives) and enjoying the friendly competition amongst their neighbors. As the media starts to promote the next Summer or Winter Olympics and you begin brainstorming ideas for another competition, consider how to create something that will be a truly memorable experience for your residents when they are already playing and honing their skills on a regular basis. While some residents aren’t interested competing, that element of competition can breathe life into your Olympics and get more residents involved by tapping into volunteers as well as creating spectator opportunities. Create opportunities for your non-competitive residents to engage as volunteers to be scorekeepers, line judges, and coordinators for the individual events. Furthermore as you designate various venues for your events, make sure you include space for spectators and consider offering light refreshments. Market the opportunity for residentsin your senior living community to come and watch and cheer on their neighbors participating in the events. You could even host a workshop where residents can make banners or signs to bring with them and cheer on the Olympians. This can inspire not only your competing Olympian to feel the support of their neighbors, but it might also inspire a resident who is watching the event to give it a try themselves the next time around. I’m not talking black ties and ball gowns, but do consider hosting a more formal approach to an Olympics by including an opening and closing ceremony as well as medals ceremonies for the different events you offer. Promote these ceremonies to the entire community and not just the Olympians. If residents are already use to regular tournaments for the recreational programs at the community, these ceremonies can help set your Olympics apart from the offering they partake in from month to month. If you are hosting a variety of different events in your Olympics, have a parade at your Opening Ceremonies to present your Olympians in each event. If you are able to tap into resident volunteers and spectators, recognize their contributions with spirit awards at your Closing Ceremonies. Your residents are already competing amongst themselves on a regular basis. 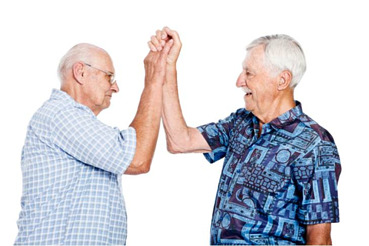 Why not unite your residents into a team and invite neighboring retirement communities to be your opposition for the Olympics. Plan the friendly competition well in advance so all participating communities have a chance to practice and hone their skills at the events that will be offered. While corn hole, for example, may be a big hit with your residents, it may be a new activity to residents at another community and they’ll need some time to reach Olympian status. This can motivate your residents to come together as a team and provide a fresh spin on an activity they already know and love. Up next in part II of this blog, I’ll outline the variety of events you can consider for your Olympic Games. Click below and subscribe to our best practice series and see how our active aging staff create great programming to engage residents!